Sometimes, when you go underneath the layout and look up, you don’t have the tracks or other orientation to assist. In such circumstances it can be difficult to work out where you and track pieces are. 1. Export the layout as BMP or JPG picture using “File” > “Export” menu command in SCARM. 2. Open Paint and load the exported image file. To open Paint, go to Start menu, All Programs, Accessories and click on Paint. Alternatively, you can navigate to the folder where you’re saved the exported picture, right click over it and then choose “Edit” from the context menu. 3. When the layout picture file is loaded in Paint, press Ctrl-A – this will select the entire image. 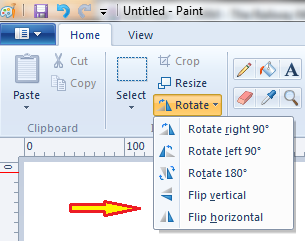 Windows 7/8 – click on “Rotate” button and choose “Flip Horizontal” or “Flip Vertical” item from the drop down menu. This will mirror the image horizontally or vertically. 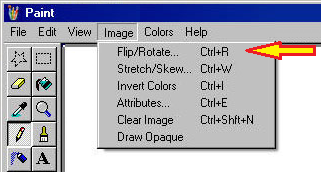 Windows XP/Vista – select “Image” > “Flip/Rotate” menu, choose “Flip Horizontal” or “Flip Vertical” items from the dialog and press OK button. 5. Save the file for later printing or print it directly from Paint. Now you will have an inverted schematic image of your track plan that you can use when working under the table. Starting from version 0.9.32, you can use the “Flip” command in “Edit” menu in order to flip the selected items in the editor horizontally or vertically. This entry was posted in Outdated Topics by Milen Peev - Author of SCARM. Bookmark the permalink.